The kiddos are having a blast this week! We have never studied rocks or minerals before, so this is a first for all of them. I'm not sure who's enjoying the unit more. If this is your first time visiting Every Star Is Different, please follow us here, like us on facebook and/or on Pinterest. A new unit is posted almost every week with free printables for everyone! Moving on. Here's what we've been doing this week! I really tried hard to make sure the unit was enjoyable for girls and boys alike. As I mentioned earlier, the kiddos have never been introduced to rocks and minerals of any kind, except for in backyard play. I thought it would be fun to learn about birthstones, counting syllables as we go, in order to learn how to pronounce the words. The markers are "birthstones" to be matched up with the correct card. This has been a favorite activity. It's also helping the kiddos remember how to identify the months of the year. They're so excited to learn about everyone's birthstones. 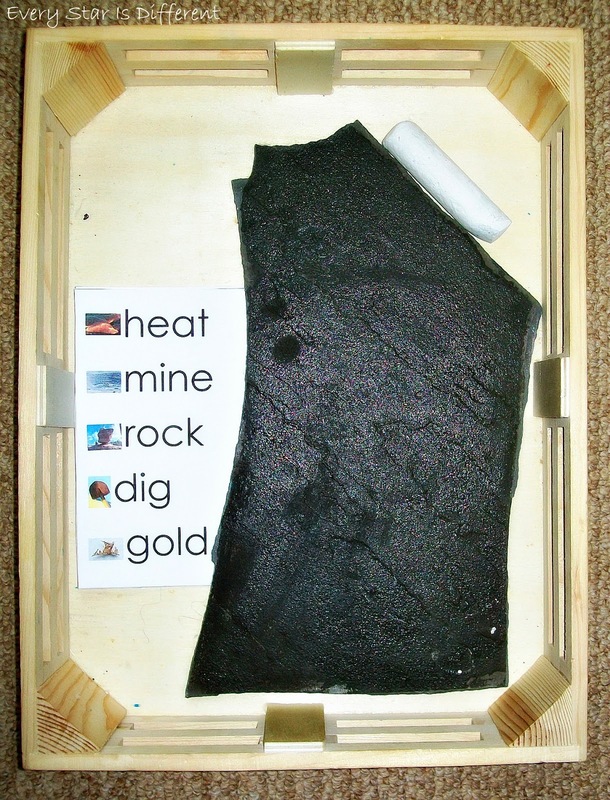 Source: I created the printable for this activity as part of my Rocks & Minerals Unit Language Printable Pack. For your free copy, click on the link at the bottom of this post. Inside the bowl is play dough filled with several different minerals to match the mineral cards. 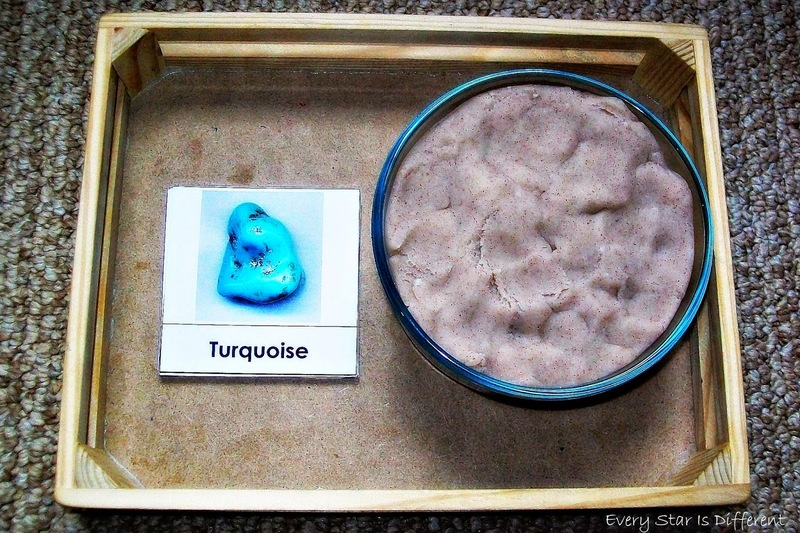 The kiddos search through the play dough, finding minerals, and matching them up to the proper cards. I found our minerals at the craft store in the jewelry and bead section. My kiddos were so excited to see chalk on the shelves this week. I am not a fan of chalkboards at all. But since it fit so well with this unit, I decided to go for it. The piece of slate was found underneath my back porch, as I was cleaning this past weekend. For those who don't have slate on hand, you might want to try a hardware or home improvement store. The kiddos will practice writing their spelling words using the slate and chalk provided. Caution: Slate is heavy and sharp. This activity should always be done while being supervised by an adult. We have a rule that the kiddos can not take the slate out of it's tray. 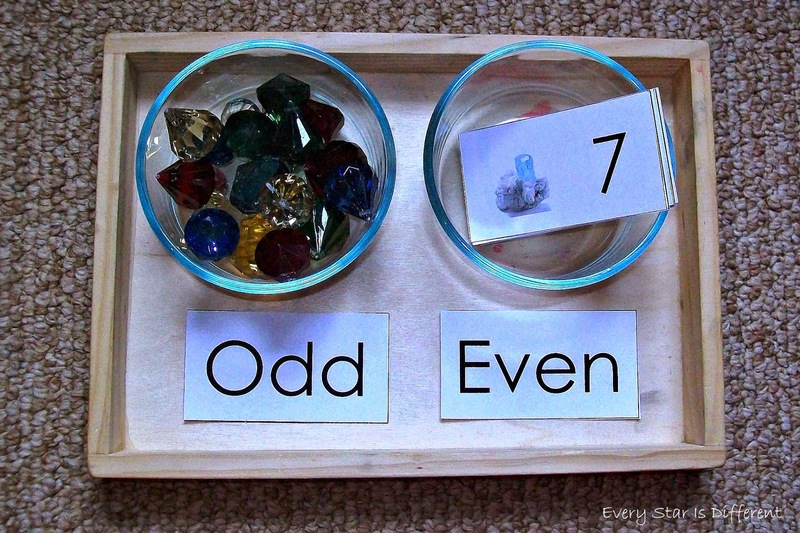 The kiddos will decide if the numbers are odd or even, using jewels as counters if necessary. 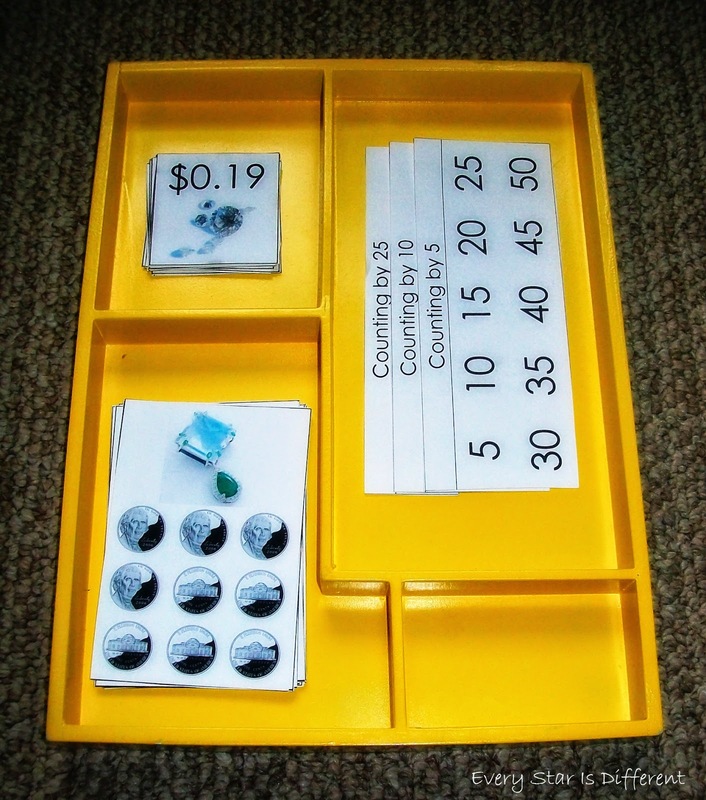 Source: I created the printable for this activity as part of my Rocks & Minerals Unit Math Printable Pack. For your free copy, click on the link at the bottom of this post. 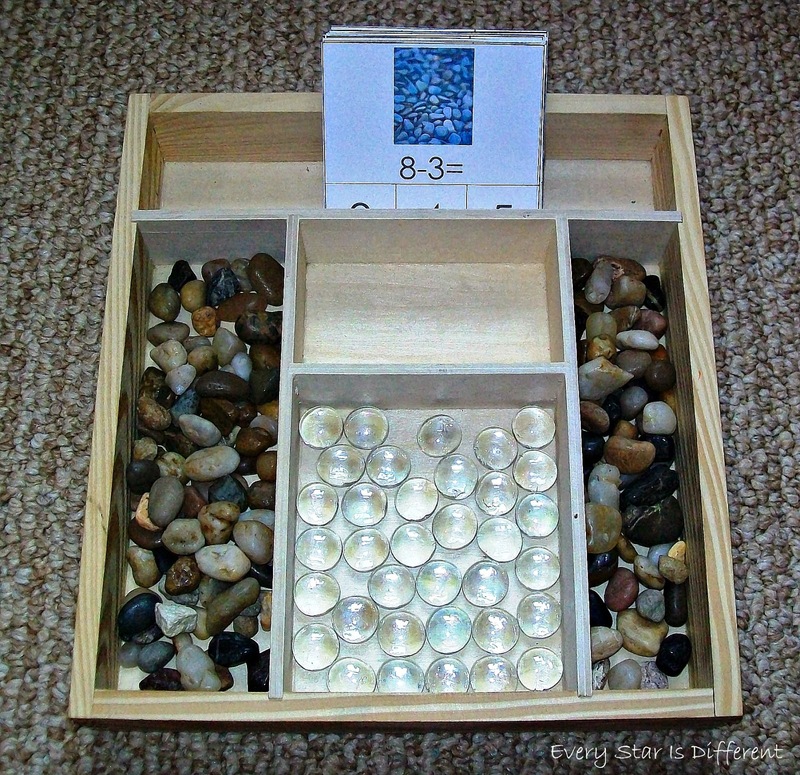 The kiddos will solve the subtraction problems on the cards, using rocks as counters, and clear glass beads as markers. The kiddos will match jewel & coin cards with money amount cards, using the counting cards when needed. 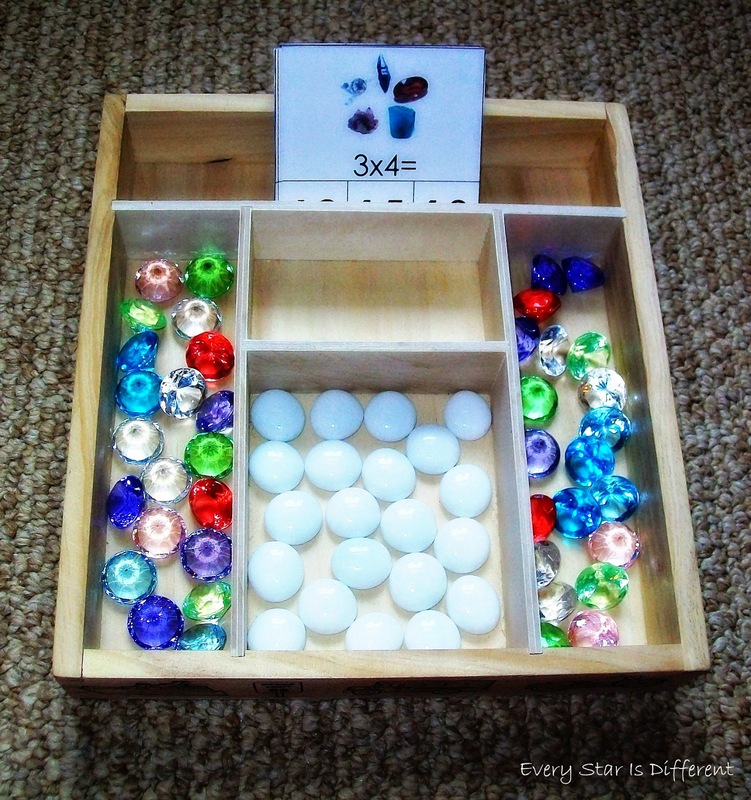 The kiddos will solve the multiplication problems on the cards using the jewels as counters, and glass beads as markers. The kiddos will match up Igneous, Sedimentary, and Metamorphic Rock cards with their label cards. I've written I, S, or M on the back of each of the cards in case the kiddos need them. I was so impressed that Dinomite answered all but one right his first try, after I explained what each type of rock looked like and how it formed. 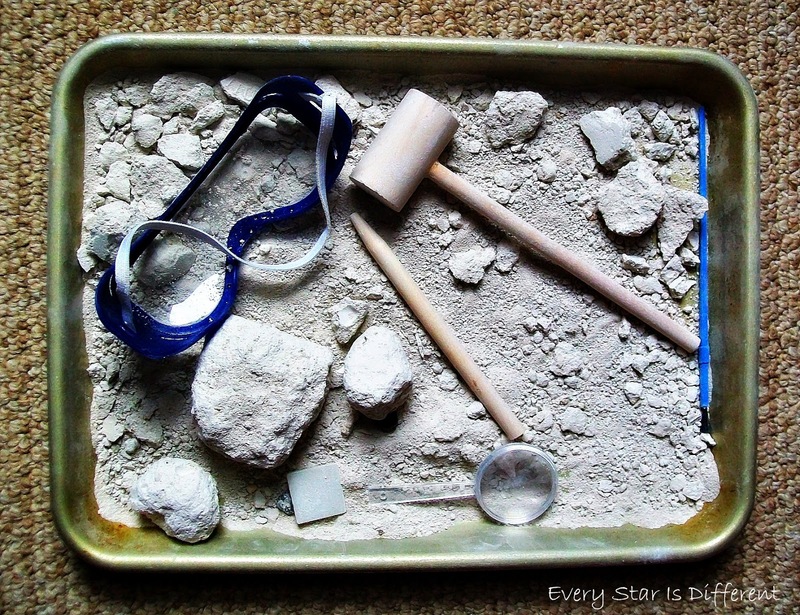 Source: I created the printable for this activity as part of my Rocks & Minerals Unit Science & Culture Printable Pack. For your free copy, click on the link at the bottom of this post. I found these fabulous excavation kits at our local craft store on sale last week. The kiddos love kits like this. 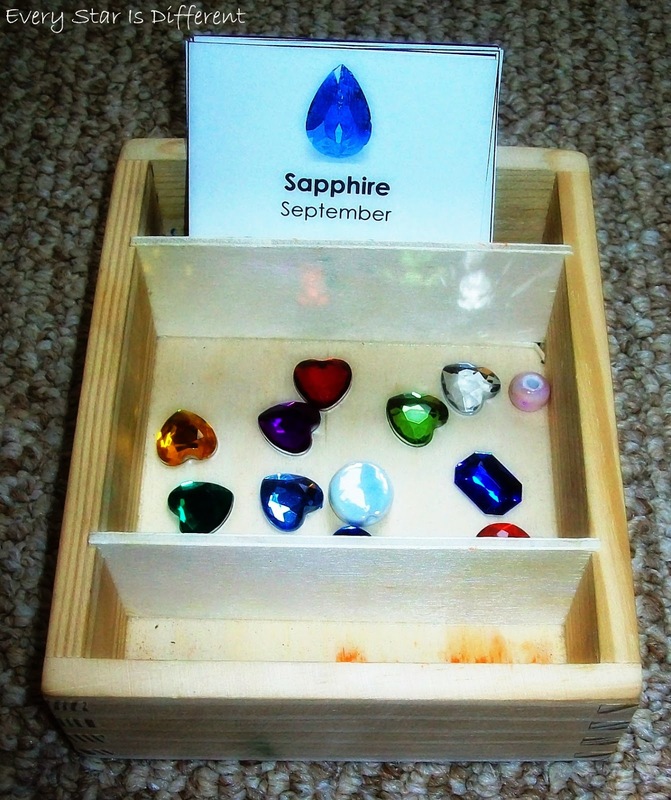 They've been a fabulous way to work on fine motor skills, hand strength, mineral identification and so much more. All of the kiddos are doing a fabulous job! It's important to learn the names of different types of rocks and minerals, but I wanted to do more than just that in this unit. As I was researching and preparing materials, I couldn't stop thinking about the Earth and it's beauty. There are so many amazing natural treasures hidden within it, and on it's surface. 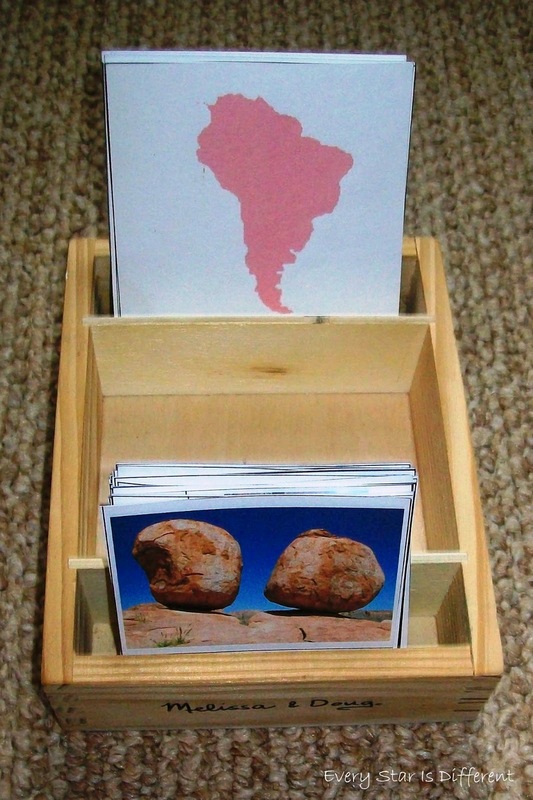 In this activity I've selected naturally occurring rock formations that the kiddos will match up with continents. 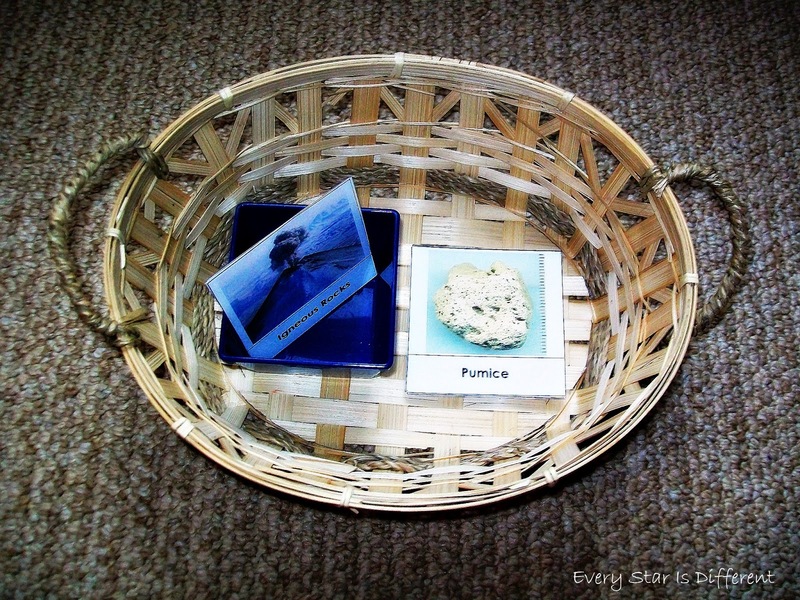 The kiddos really enjoyed this activity! Rocks and minerals are great by themselves, but they can be shaped and/or used to build magnificent creations. 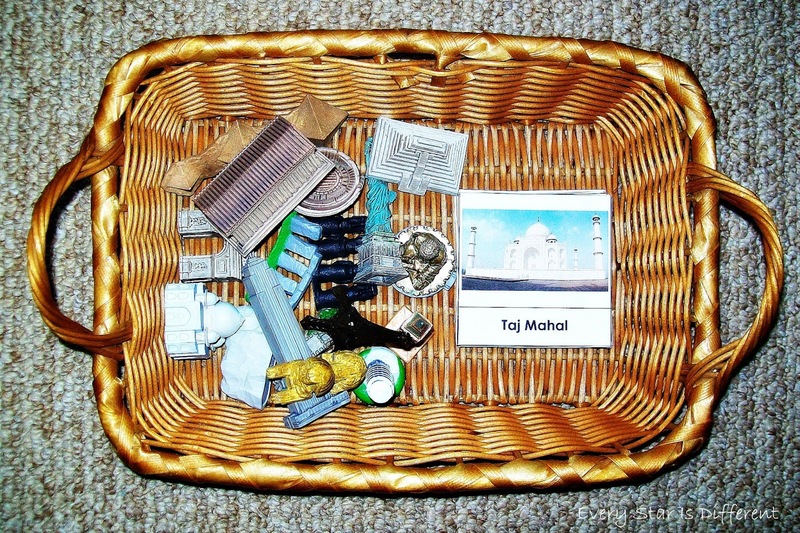 In this activity the kiddos will match the cards up with the creations. There are a couple creations that only parts are made from rock and/or minerals. This activity was very eye opening for the kiddos. 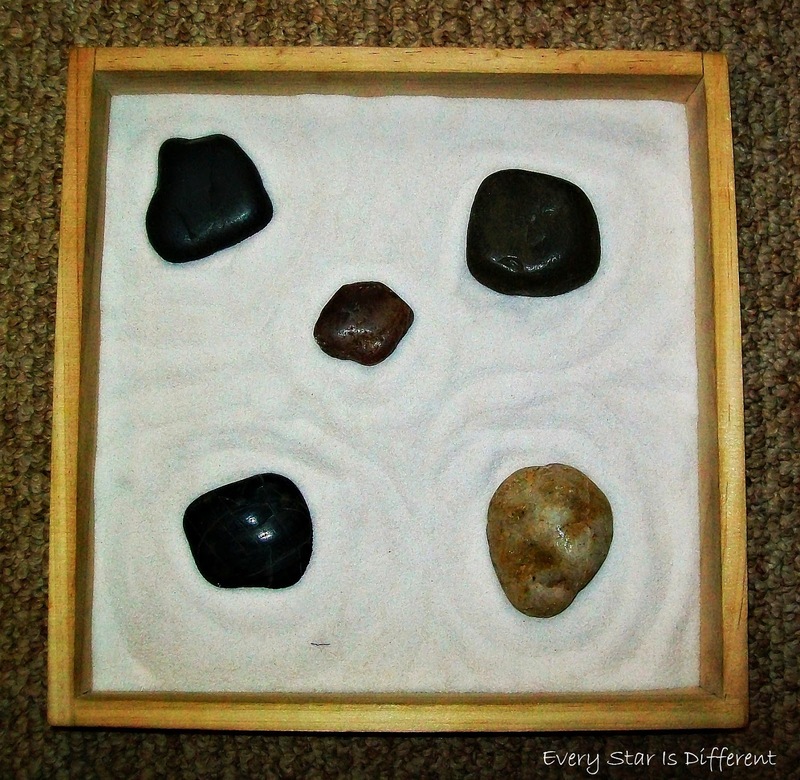 The kiddos will make their own Zen Gardens. I have sample cards for them to see what they are, if needed. I can't wait to see how they do! The kiddos will enjoy playing in this sensory bin. I haven't decided if I want to add water to it or not. We'll see. Bulldozer has already spotted this and fallen in love. This is the girl's version of a rock sensory bin for the week. Princess was not at all excited to study rocks and minerals. I was able to take the opportunity to teach her that rocks and minerals were not just things we found on the ground outside, but materials used to make jewelry, one of her very favorite things. 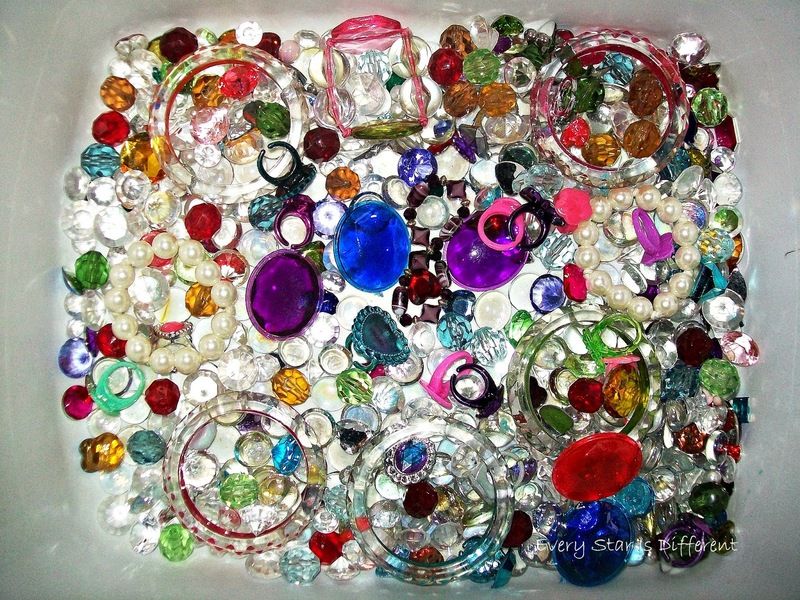 With this new information, she went through her dress up bin, picking out as many jewels as she could find to add to the bin. The boys will enjoy this bin as well. For those interested in the free printables shown in the activities, click on the links below. 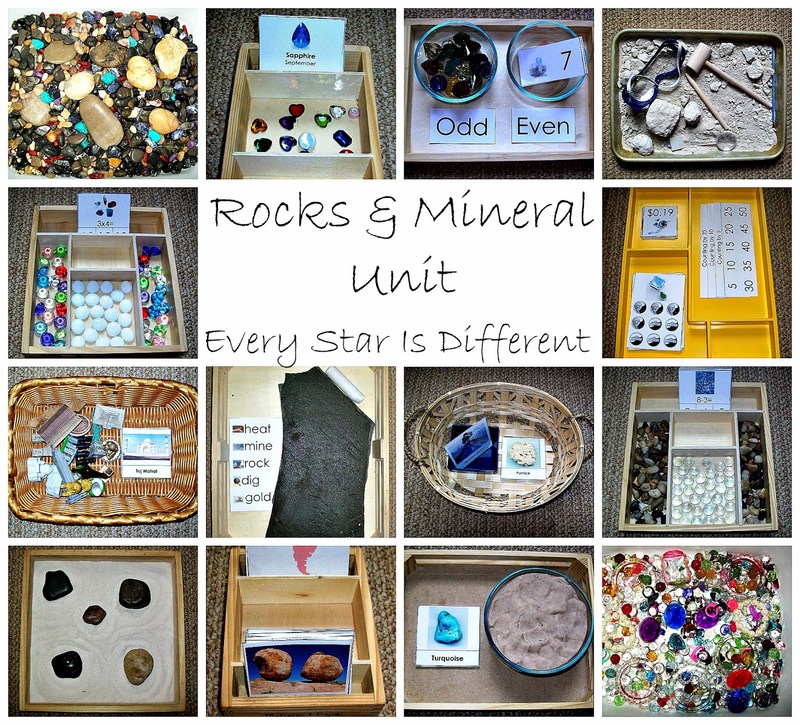 If you're looking for some other fabulous ideas for your Rocks & Minerals Unit, I highly recommend checking out these posts. They are my top three picks from my Rocks & Minerals Themed Facebook Share Day. 1. Painting with Rocks at Fantastic Fun and Learning. She also has links to many other rock activities. 2. Edible Rock Cycle for Kids at Lemon Lime Adventures. If Bulldozer weren't allergic to the fruit juice in Star Bursts, we'd so be doing this as part of our unit! 3. A Rock Day at Planet Smarty Pants. There were a few really great ideas here. What an incredible resource! Thank you so much for sharing! Such clever activities and ideas! Great unit! I love all the effort you put into what your kids learn! Thank you Cassie! It's so important to me that they learn all they can in a way that works for them. What awesome ideas. 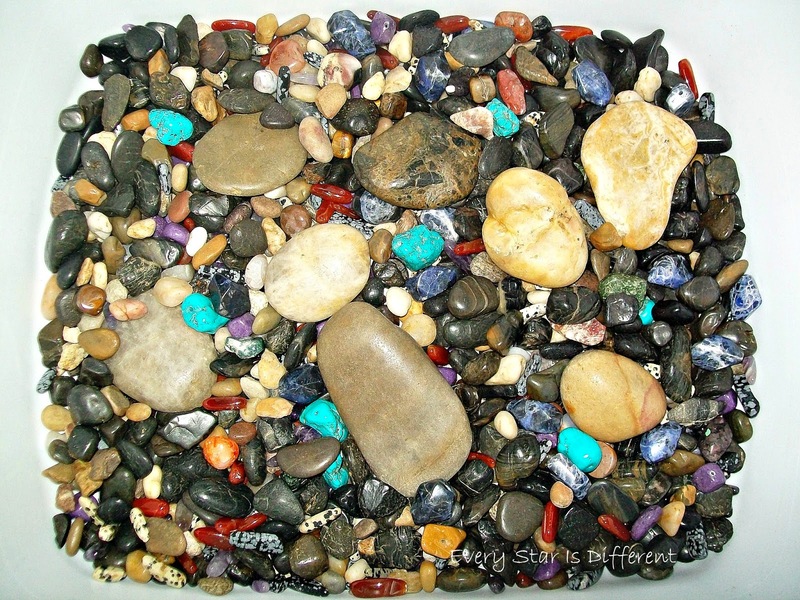 I am hoping to do some activities with rocks and this is a great resource! Thank you Sarah! Good luck with your rock unit! Thank you Yuliya. Such a beautiful name. I hope to see you back here soon! Thanks for sharing at After School!! Studying rocks at the beach is the best. Thank you so much for the feature! Fabulous as always, and what kid wouldn't want to get their hands on all the sparkly jewels! Amazing. I have a large rock unit on m blog yet we both have such different things.